I’m thrilled to be able to introduce, now, several new additions to the La MaMa Archives cataloging team. This great crew is helping us successfully complete the final quarter of our CLIR-funded Hidden Collections cataloging project. Michael Grant joined the team as a part-time Cataloger back in September. Michael graduated from New York University’s Moving Image Archiving and Preservation Masters program last spring. In addition to contributing to La MaMa’s cataloging projects, he works at NYU Libraries reformatting and preserving critically out of print VHS and audiocassette titles, ensuring their accessibility for use and study in the future. He is also a member of XFR Collective. At La MaMa, Michael has been working on a describing video materials from our Pushcart Collection. September was also the month that Deborah Shapiro began what is becoming a yearlong archives internship here at La MaMa. Deborah is in her final year of the master’s program in Archives/Public History at New York University. As an intern at the La MaMa Archives, she is currently working on a digital exhibit about xerographic reproductions in La MaMa’s holdings. This exhibit will investigate questions about archival practices related to photocopied materials, and will offer (she hopes) a few ideas about what kind of information and evidence photocopied materials might provide to researchers. In November, we welcomed two additional part-time Catalogers to the team. Jameson Creager is a recent graduate of Princeton University where he studied East Asian Studies and worked at the Department of Rare Books and Special Collections. In addition to cataloging at La MaMa, he currently works in the archive department of the news program Democracy Now! Amilca Palmer comes to La MaMa with 10+ years of experience in the world of documentary filmmaking. She has worked as a researcher and producer on a wide range of documentaries, including Koch (2012), African American Lives II with Henry Louis Gates, Jr. (2008), and Sweet Honey in the Rock: Raise Your Voice (2004). At the moment, Jameson and Amilca are working to catalog materials from La MaMa’s Director’s Files. For more about each of these (amazing) folks, see About the Team. I don’t travel to all that many conferences, but when I can, I try to make it to the meeting of Association of Moving Image Archivists (AMIA). This annual event brings together a cross-section of scholars and practitioners, and offers a wide range of workshops, panel discussions, screenings, and networking events. Attending AMIA conferences has made me a far more competent and thoughtful archivist. Hi, and thanks to the organizers of the Access, Outreach, & Use stream for all their hard work. I’m here at this pop-up/lightning talk session to very briefly discuss the approach that one community-based performing arts archive is taking to access, use, and preservation of its analog moving image materials. Specifically, I’m here to talk about work that’s happening in the Archives of La MaMa Experimental Theatre Club. Sometimes called the birthplace of Off-Off Broadway theatre, La MaMa was founded in 1961, in a basement in Manhattan’s East Village, and it quickly became an important site of theatrical experimentation. I don’t have time in this lightning talk to detail the long list of artists who found a creative home at La MaMa over the past five decades, but as Harvey Fierstein notes, the theater has played a critical role in shaping American theater and culture for half a century. One of the most infrequently noted of La MaMa’s many remarkable features is its archive. Occupying 5000 square feet in a building on East 4th Street, this archive holds over 30,000 unique objects–photographs, posters, flyers, masks, puppets, costumes, set pieces, and audiovisual materials. The archives has been run on a really small budget for years, but in the past decade, La MaMa has taken steps to make its collections more accessible. In 2014, we received a CLIR Hidden Collections grant, which supports the creation of a searchable catalog of materials from La MaMa’s earliest “pushcart” years (1961-1985). Among the most vulnerable and valuable of materials in this collection is a set of ½ inch open reel video—which document approximately 170 Off-Off-Broadway theater performances staged between 1972 and 1980. They comprise the most complete audiovisual record of the early Off-Off-Broadway experiments in existence. And a bilingual (English/Spanish) production of Tom Eyen’s “The White Whore and the Bit Player” featuring Warhol superstar Candy Darling in role of White Whore. 1)Format obsolescence: Playback equipment for ½ inch open reel video is fragile and rare–the last machine of this kind was manufactured in the 1970s, parts are difficult to replace, and only a handful of living technicians know how to repair them. In 2011, Bay Area Video Coalition’s then-Director of Preservation, Moriah Ulinskas, wrote that she informed clients and partners “that they have 5, maybe 10 years left” to digitize their ½ inch open reel video–after which time “these recordings are gone for good.” As a result: digitization is a critical piece of our access strategies. Without digitization, no access to this material is possible. 2)Copyright and Actors’ Equity regulations: Audiovisual materials documenting live performances require consideration of two sets of rights: 1)rights to the recording itself and 2)rights to the underlying performance. Additionally, if members of Actor’s Equity appear in any of these productions, the recordings are also subject to Equity code regulations. 3+ 4) Preservation infrastructure + Resources: La MaMa has limited financial and staffing resources. As a result, collaboration has been critical—with NYU’s Moving Image Archiving and Preservation program, for instance; and with Bay Area Video Coalition. 5)We also face several issues that make cataloging these materials to facilitate access challenging. On one hand, there is no well-established controlled vocabulary to assist in the description of theater materials. The Art and Architecture Thesaurus, which is may be the most likely, offers only very limited terms to describe theatrical performances. Meanwhile, Library of Congress Subject Headings and other, more general controlled vocabularies, offer very limited terms for describing avant garde theatre artists, productions, and archival materials. Take, for instance, the ½ inch open reel video documenting Candy Darling and the production of “The White Whore and the Bit Player” in which she appeared. Is this queer theater? It is not about queers. More importantly, the term “queer theatre” is, in this context, anachronistic; or, at least, it wasn’t used by the people making this work. And anyhow, queer theater isn’t a Library of Congress subject heading. And yet, to my mind, it is critically important to offer user-findable access points to help artists and scholars interested in the history of theatrical work created by LGBT people and communities locate related materials. Similar descriptive issues arise in relationship to many of the other artists and productions documented by these videos. OK: my five minutes are up! Read our blog, tweet at me, and tune in next year when (hopefully) more of this collection will be in the process of being digitized. For the past year and a half, I have had the joy of cataloging many of the programs, flyers, letters, brochures, clippings, contracts, receipts, photographs, and the occasional Frisbee residing in the La MaMa Archives. From 1962-1985, La MaMa’s “pushcart” years, Ellen Stewart’s vision propelled a generation of theatre artists to launch the off-off-Broadway movement. Starting from a basement in the East Village, by 1985 La MaMa had grown to a campus of several theatres in the neighborhood and sent many of its productions and artists well beyond it, to Broadway, to the silver screen, and around the world. Suzanne at her desk at La MaMa. My journey through the material treasures saved from this era has followed a similar trajectory. In the early days, I cataloged documents from the very first year of La MaMa’s existence. Some of these shows had only a single program or flyer remaining to mark their place in theatre history. As time went on, the files became more complex. La MaMa and its personalities garnered more press clippings, business and personal correspondence piled up, and productions extended their runs or went on tour, leaving behind an extensive trail of administrative and artistic documents. I have had the cataloger’s privilege of deep engagement with these documents: I have felt the texture of the papers upon which La MaMa’s history is printed, I have come to recognize Ellen Stewart’s scrawled handwriting upon any blank space in any kind of document, and I have glimpsed the nature of the relationships between some of La MaMa’s most beloved and influential figures. At the same time, these materials cannot fully capture the essence of witnessing an early La MaMa production or, behind the scenes, the countless telephone calls exchanged in the course of artistic creation. The purpose of this project is to reveal what has been hidden. Through our Collective Access catalog, which will be accessible through a public website in the next few months, our cataloging team has striven to bring La MaMa’s history in an accessible manner to anyone who seeks it. While much of La MaMa’s story lies in the people who lived it, this project has, for the first time, given thousands of archival materials unique classification and description, and it has linked La MaMa people, productions, and objects to one another in clearly denoted relationships. In my time with the project, I was able to contribute over 2,000 object records to the catalog. This month, I embark on a new stage of my professional journey as a staff member at the New York Public Library for the Performing Arts. My time at La MaMa has immersed me invaluably in theatre history, the off-off-Broadway community, and the triumphs and tribulations of archiving and cataloging. I am immensely grateful for this experience, and I look forward to continuing to bring theatre history of all kinds to the researchers, artists, and enthusiasts who pursue it. This month, Dario D’Ambrosi brings Medea back to La MaMa. D’Ambrosi, an Italian theater-maker whose connection with La MaMa extends decades, has devoted much of his career to making theater with and about people with psychiatric disabilities. 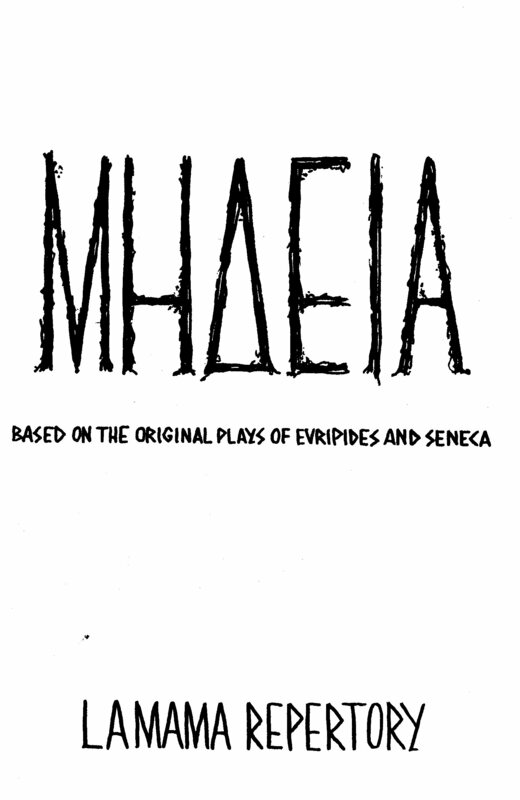 His Medea (which uses both English and “Attic Greek”) builds on this legacy, and features actors with a range of “diverse abilities” (including epilepsy, neurological disabilities and down syndrome). In Anouilh’s version of the classic tragedy, the title character lives in a trailer park and dies in flames. Staged at 321 East 9th Street, the production starred Ellen Maris as Medea, Steve Merrick as Jason, Mary Boylan as the Nurse, and Robert Altman as Creon, Boy, Guard, and Narrator. 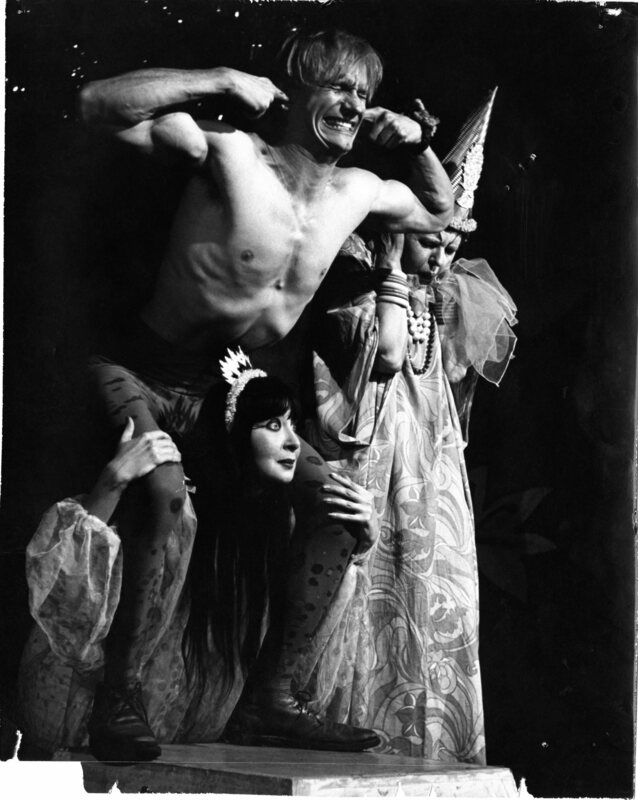 In the 1970s, Medea was a mainstay of the work of The Great Jones Repertory. 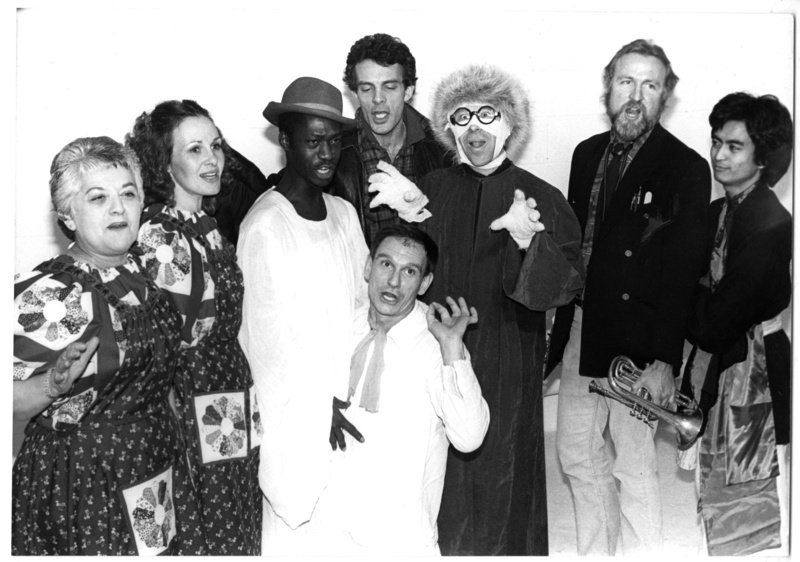 It premiered at La MaMa in 1972, and formed a part of the company’s core repertory for many years after that, featuring in their tours to Germany, France, Lebanon, Iran, and elsewhere. Join La MaMa and D’Ambrosi and his cast October 8-18 to see what this new experiment reveals. I’ve been thinking, this week, about the trouble with archiving performance. The essay I’ve started writing about it — in my head, at least — is called “Community, Presence, and the Dilemma of the Performing Arts Archivist.” For me, the importance of preserving and facilitating access to documentation of performance events is driven by my own sense of the power of live performance, and a few exquisite experiences I’ve had as a performer, producer, and audience member– experiences that have shaped my sense of what is possible, and what’s important about our personal and collective struggles, and how we might live more electrically. The trouble is that the archival record rarely offers anything at all that can reproduce, convey, or document those experiences. We can learn a lot by reading correspondence related to, or watching a videotape of, a performance– but what we learn there has very little to do with what happens when you are gathered together with other live bodies in a room, telling each other stories. This dilemma gains new depth as I mull the epic 3-day revival (or whatever you call it; revival is not really the right word) of Jeff Weiss’s “And That’s How the Rent Gets Paid,” that ran at The Kitchen last week. As anyone who’s ever had the good fortune to see or participate in Weiss’s work will tell you, no archive will ever be able to capture the power of Jeff Weiss or “And That’s How the Rent Gets Paid.” This is theatre that relies, for its power, on live presence; theatre that makes, and solemnifies, community. How to archive that? Why bother trying? And yet, I still find utility in the archive. Its true that no collection of documents will ever replace the experience of sitting in the audience while Weiss and his co-conspirators make us laugh and laugh and burst out with a longing we can’t describe and then cry. But maybe the archive can help us make sense of those feelings, those longings, and the possibility we glimpsed in the confusing dark. Maybe the documentary record of Weiss’s life and work can tell us different kinds of stories to help us make our way. Maybe the archive can also help us understand how people and events came to take the shape they took, or transmit at least a hint of these histories to new generations. Weiss has been making disarmingly powerful theatre for decades; there’s precious little scholarship or writing about his life and work; and far too few members of younger generations know anything about this legacy. 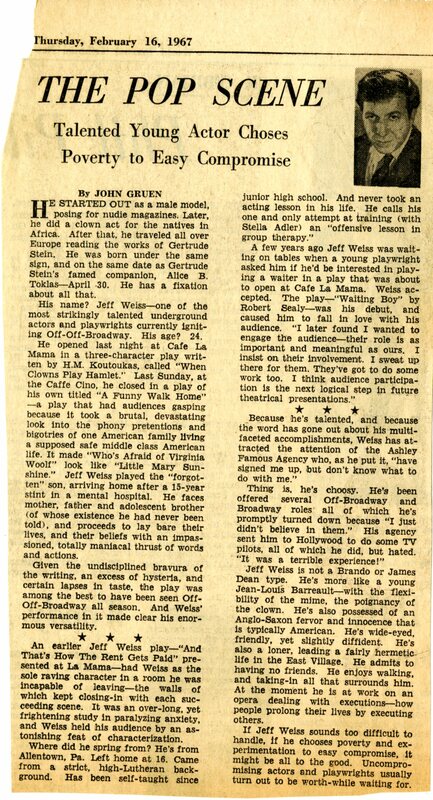 Its not that there’s no writing about Weiss and his work; theatre scholar Stephen Bottoms, among others, has written about Weiss’s life and work: “Weiss wrote and appeared in his own material under the direction of his lover, Ricardo Martinez, with whom he shared a close personal understanding,” Bottoms writes in Playing Underground: A Critical History of the 1960s Off-Off-Broadway Movement (2006). “The results were extraordinary, as the superlatives showered on Wess by interviewees for this book demonstrate: ‘He’s just the greatest’ (O’Horgan); “A dazzling virtuoso, a consummate theater craftsman in every area’ (Patrick);…. ‘The best things ever done at La MaMa were by Jeff Weiss’ (Kornfeld). Very much his own creation, Weiss was untrained as an actor, having quit Stella Adler’s class–which he saw as an ‘offensive lesson in group therapy’…–after just one session” (p. 330). Its just that this isn’t enough. And so that’s why, as I came down from the high of experiencing “And That’s How the Rent Gets Paid” last week, I turned back to La MaMa’s archival holdings for– well, for whatever we’ve got about Weiss and his work. There’s a lot here, too much to share in one tiny blog posting. But I do want to share some of it (especially material from the 1960s and 1970s), so that those you who are already Weiss fans can enjoy the inadequate delights they provide, and so that those of you who have never heard of him can begin to wonder about this incredible artist, his work, his legacy, and his worlds. 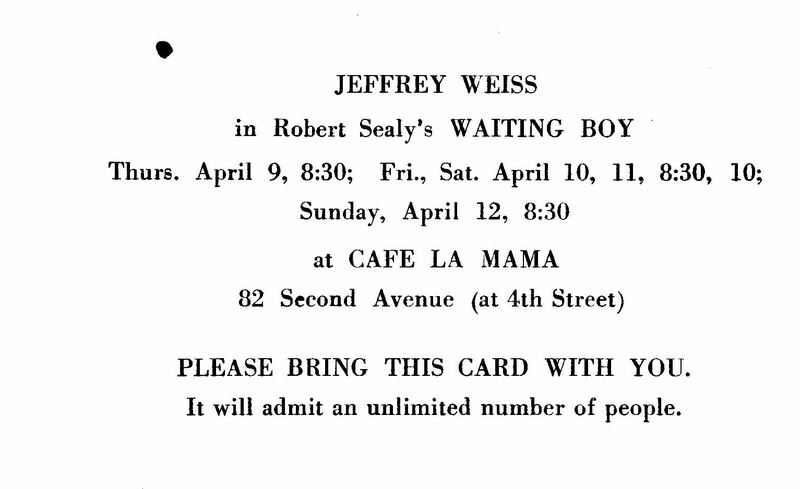 1)The earliest object La MaMa’s Archives holds to document Jeff Weiss’s work is a postcard invitation to Robert Sealy’s “Waiting Boy.” This 1964 production marked the first of many times that Weiss performed at La MaMa. Sealy supposedly cast Weiss after seeing him waiting tables at La MaMa, earlier that year. 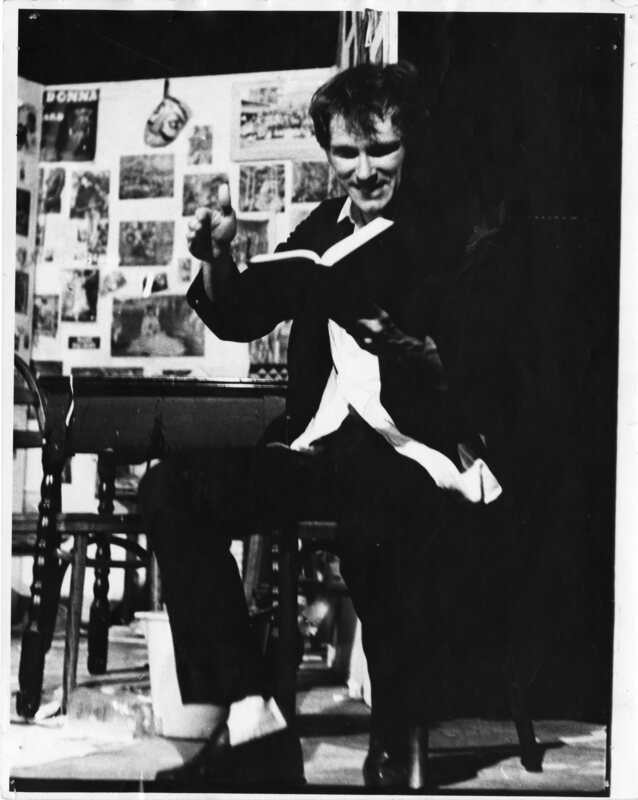 “Weiss was” Bottoms writes, “an instant hit.” These were the days when La MaMa was still known as Cafe La Mama, and occupied a space at 82 Second Ave.
2)The archives also holds several objects that document early versions of “And That’s How the Rent Gets Paid.” Among these objects is a photograph of Weiss performing the piece at La MaMa in August of 1966. This version of “And That’s How the Rent Gets Paid” featured Weiss onstage solo. As Bottoms writes: “Welcoming the audience into his ‘home,’ [Weiss] regaled them with tales of his attempts to raise the cash to pay his back rent, while indulging tangentially in a ‘cascade of fantasies, reminiscences, meditations, poetry-readings, and miscellaneous schticks’,” (Playing Underground, p. 330). The photographer who created this image is unknown. 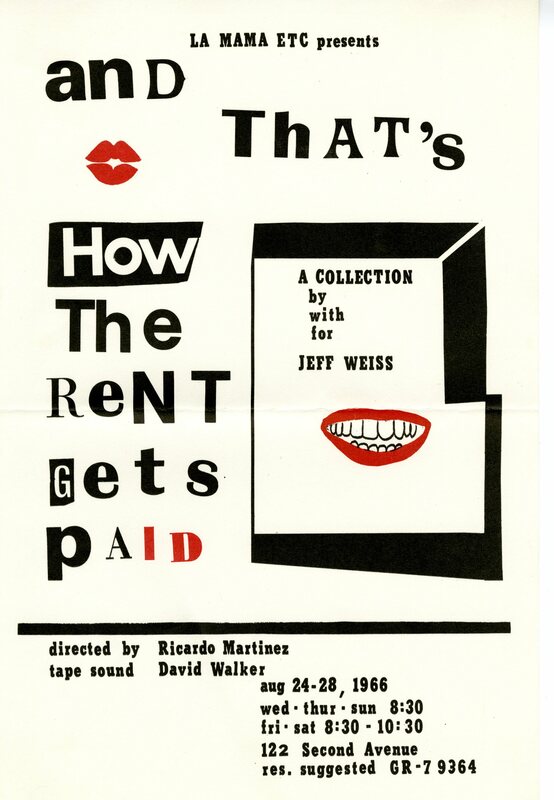 7) But “And That’s How the Rent Gets Paid” wasn’t the only show Weiss wrote and produced at La MaMa in the 1960s and 70s. Below, for instance: a promotional photograph for Weiss’s 5-hour long “Dark Twist” (March 1979), which co-starred a young Nicky Paraiso (pictured at far right), among others. Photo by Carol Rosegg. These documentary fragments might be inadequate representations of Weiss’s monumental theatrical legacy. But I’m still really glad they exist.